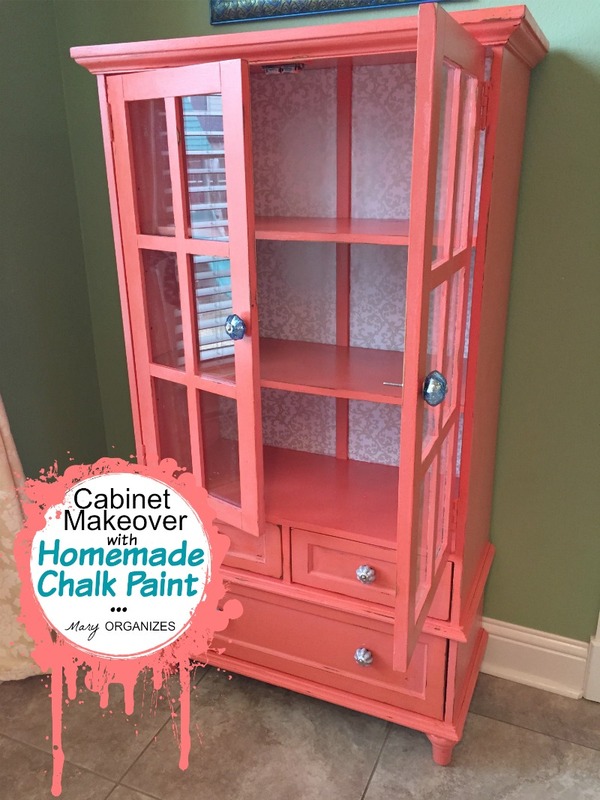 This Spring I decided to add coral to my homes color palette, so when I wanted to update my little dish cabinet in my dining area, coral seemed like the fun choice. Though definitely fun, it was a little scary to add such a bold color, but now that I’ve gone bold, I would never go back! I bought this cabinet over three years ago. 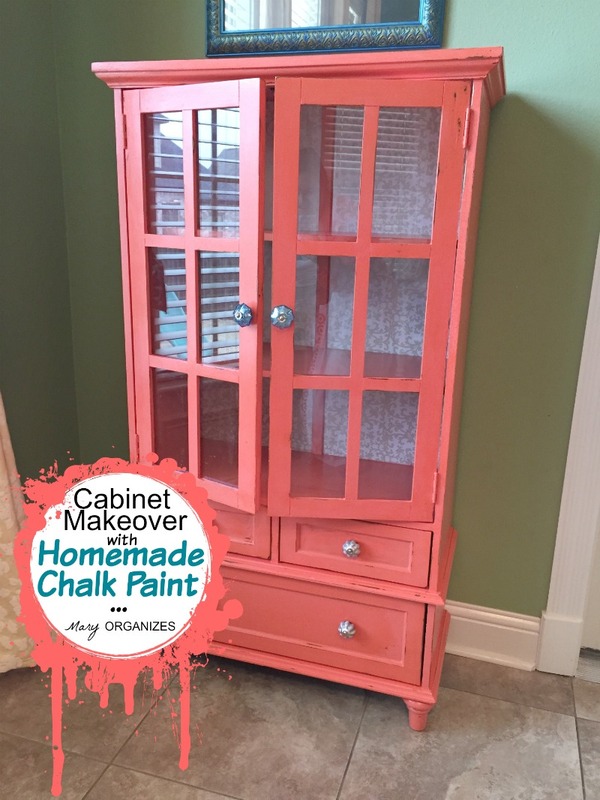 It was a very inexpensive, put-together-yourself cabinet and I viewed it as a place holder for a beautiful $1200 dish cabinet that I wanted. Finally I decided to make my temporary cabinet into something I loved even more than the expensive one. 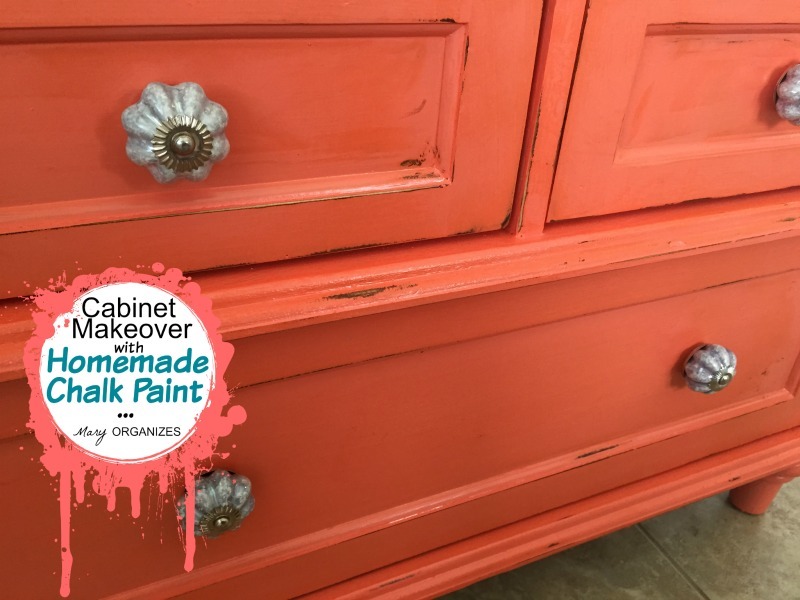 My friend had just refinished a few pieces in her house with homemade chalk paint, so she gave me the courage to try homemade chalk paint. Well, she actually took me to the store and told me what supplies to buy – so she did more than give me courage! My box of plaster of paris is so big, I better think of some more projects after this! Mix the water and powder together first. I mixed in a disposable container with a lid so that I could save it in between coats and then throw it away at the end of the project. Once the water and powder are mixed well together, mix in the paint. This was the cabinet before I did anything. I put down plastic right in the dining room so I didn’t have to move the cabinet very far. I wiped down the cabinet, mixed the paint, and then just started painting. I gave everything a few coats. The consistency is like butter! I let it dry overnight and then I gave it a light sanding. The sanding was for a shabby chic effect. I focused on scuffing the corners and places the cabinet would wear naturally over years. Next I wanted to add wrapping paper to the back of the cabinet. I found a pretty white/silver damask wrapping paper. I used the same polyurethane I used to seal the cabinet, to attach the wrapping paper. I “painted” the pack of the cabinet with the lowest sheen of polyurethane that I could find, then smoothed on the wrapping paper that was cut to fit. Then I painted more polyurethane on top of the wrapping paper. 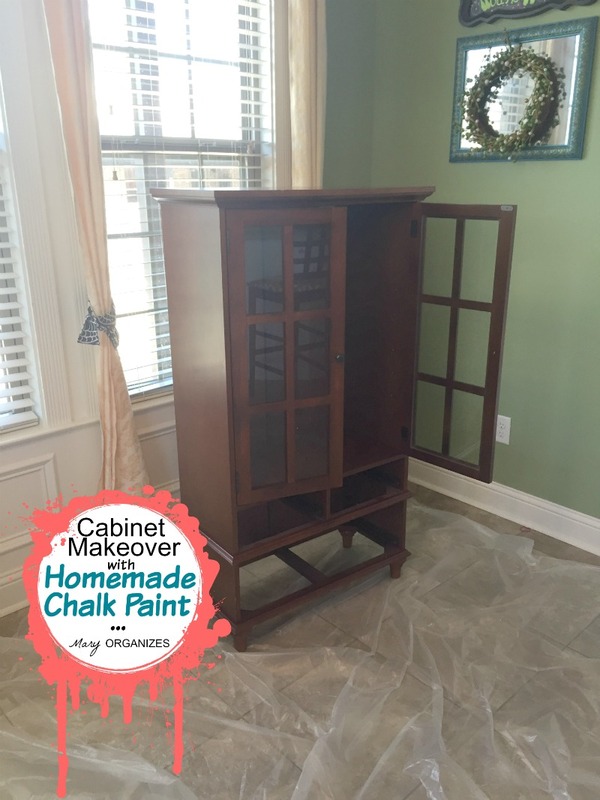 After that, I painted polyurethane on the entire cabinet – anywhere I had painted with chalk paint. I chose polyurethane instead of wax so that I could just do it once. When the poly coat had dried, I added some fun new knobs/ pulls (you call those different things depending where you live!). I just love love love how the cabinet turned out. It changed the entire feel of the room! Come back tomorrow because I’m going to show you the dining room all put together, with special new-to-me family heirloom dishes in the cabinet!! Love this! I have a chair I want to rehab. 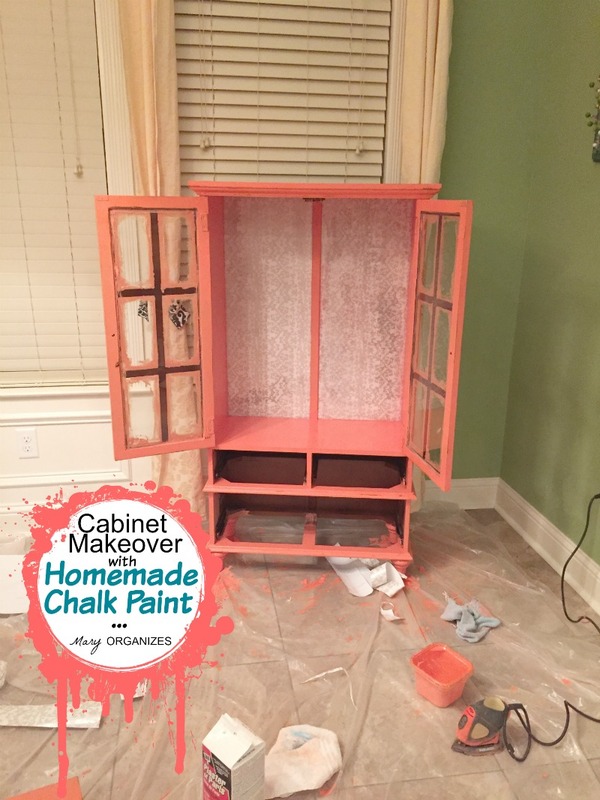 Thanks for giving me the courage to try homemade chalk paint – and coral! Question: Do you need to do anything to prep the piece you’re painting? Sanding? Stripping? SO pretty! I love it! What kind of paint did you use? Like, regular wall paint or acrylic craft paint? Thanks for your inspiration! It was regular wall paint. And thank you! Thank you! I want to try it very soon on a cabinet I need to update! Your instructions make it seem very easy! It is very easy!! Go for it! Wow, you make it look so easy. Thanks for sharing and inspiring! You’re welcome! It took me a while, but it wasn’t difficult. Why chalkboard paint instead of regular paint? 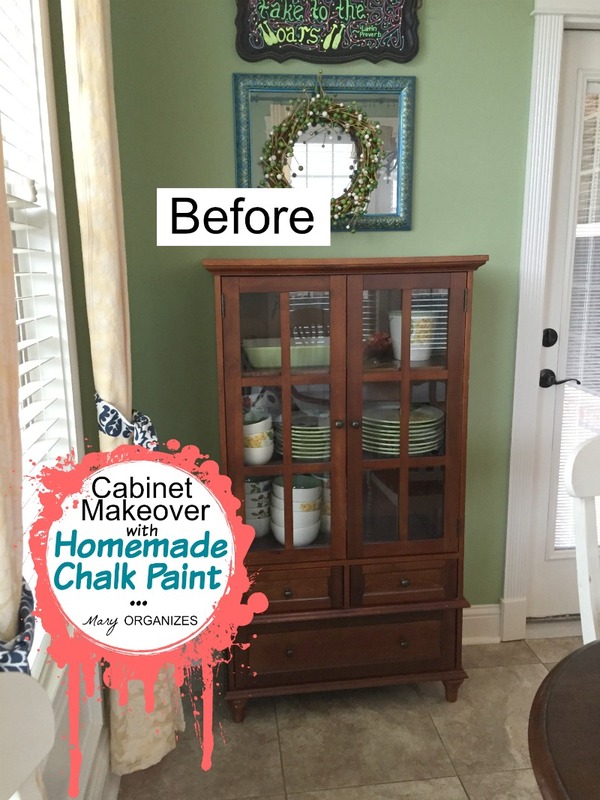 Chalk Paint is different than chalkboard paint. 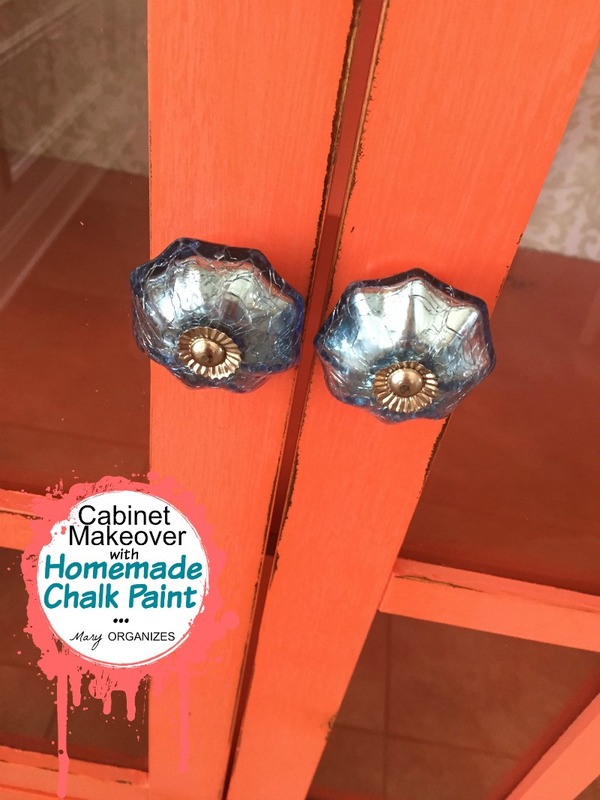 The reason I chose chalk paint is that it doesn’t require any prep work to the surface like sanding or stripping. It also has a unique feel, doesn’t show every brush stroke and distresses really well. I’m so glad you clarified in the above question that chalk paint and chalkboard paint are different. 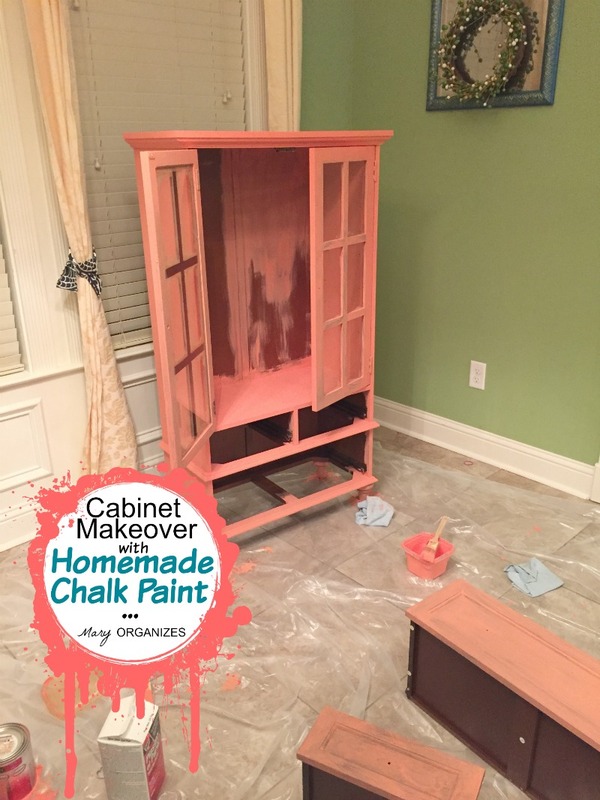 I couldn’t for the life of me figure out why you would want to make the cabinet a surface to draw on with chalk!! Lol. It’s beautiful! Heidi, that was my exact thought, too. I didn’t know there was a difference. 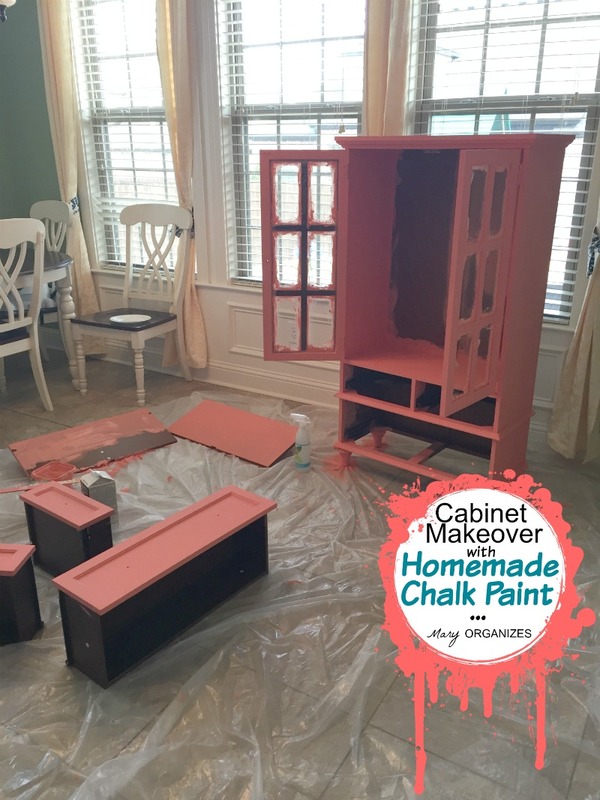 I did a horrible job of painting my cabinets when I got them, so this seems like it might be a great idea for repainting them. When I get the decluttering, cleaning, and organizing done, I might just take on that project. Thanks, Mary! You’re welcome! And you might be surprised what you’re in the mood for after you finish decluttering and organizing!! Amanda – I bought the Purdy brushes at Home Depot. I got the store brand (cheapest) in the flat finish. The poly is just the standard satin finish Minwax polyurethane. I think you can see it in one of the pictures. It is the golden colored container. Excited for you!!! What color did u use? I’m pretty sure it was Sherwin Williams coral, which is their color of the year. You can have any brand of paint color-match to it.